First Time Log On: You’ll need to choose your questions and answers the first time you log on to Procare. This would happen right after you log on and change your password. Log On After Update: You’ll need to choose your questions and answers the first time you log on after Procare Cloud is updated to version 10.2.4469 or after installing the Server Patch to version 10.2.4457 or higher. Forgot Password: If your log on fails, a Forgot Password link will appear (image below). Click the link and answer the questions to reset your password. Change Your Questions: At any point you may change your security questions and answers. 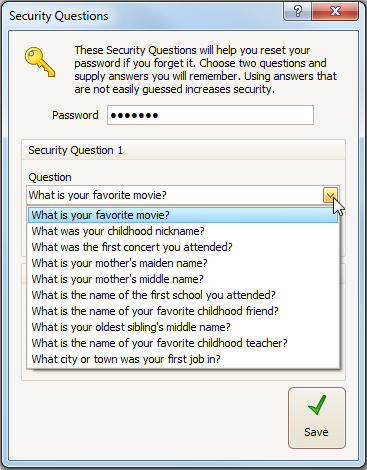 From the Procare Home screen go to Configuration > User > click Security Questions. You must know your current password. Enter your Username and click Load Questions. Type your answers and click Reset Password. Select questions to which only you would know the answer. If everyone knows your favorite movie, because you talk about it or post it on Facebook, choose a different question. Select your security questions. You must select two different questions. Type your answers. Answers are not case sensitive, so “Finding Nemo” is the same as “finding nemo” or “finDing neMo”.